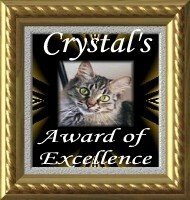 On June,6,2001 we received our first award - Crystal's Award of Excellence.We feel so happy! All our friends are welcome to share this joy with us! And this is our second award, also very important for us. We received it on June,7,2001. Hope we are worthy it. It was very flattering for us to receive this great award from Poul, the owner and designer of extremely beautiful site The Beauty & The Beast. 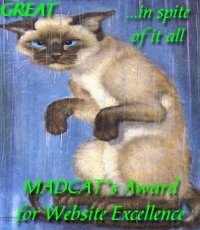 One more very pleasant award of ours, the MadCat Award from Black Rock Ranch. Don't forget to visit their site - it's great.